A football club is moving season ticket holders out of a main stand over safety concerns caused by supporters standing. 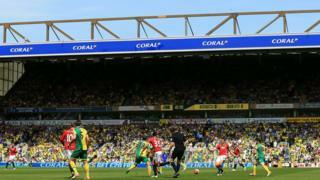 Norwich City FC said a safety group had told it to stop youngsters standing on seats or face having its capacity cut. Canaries fan Ellen Ellwood, who attends with her grandson, said it was unfair that younger fans had to move because adults were standing up. The club said adults standing at the Barclay End at recent games were a threat to the safety of young fans. About 50 supporters with season tickets in Block A of the stand have received a letter from the club telling them they must move. That includes 31 people aged under 16, along with the adults who attend matches with them. Managing director Steve Stone said: "It's got to a point where we've got an unacceptable level of risk to kids." The county's safety advisory group had been monitoring crowd behaviour and told the club a block of 200 seats would be closed over concerns for the young fans. "It's too difficult to stop fans. They are not necessarily standing in the safest environment," Mr Stone said. Ms Ellwood said it was unfair having to move because adults were thoughtless about other younger fans behind them. "The people who complained in the first place were those who could not see because others were standing in front of them," she said. "Everyone should be able to watch games," she added. Norfolk County Council said: "Our sole concern is for the safety of children and other spectators. We hope that the club's actions will be successful and will not require any loss of capacity at the ground."